I think I get it now that I've seen the pictures; basically set up like that it just goes to ground regardless of what's been selected. The EQ cap in the Mark V was the one from non-EQ IIc+ models, I can imagine it making a difference although I've already got similar orange drops to a IIC+. I'll think about it as I have to make instructions for these mods since I don't want to risk damaging the board by doing it myself. You're always welcome to have a go instead next time you're down this way. And yeah as has been said, simuls are brighter, but paradoxically the component changes in the preamp were an attempt to brighten it as it was felt to not be bright enough. I can't see letting more treble in at c27 ruining anything, or deleting C30, since it's already deleted in the stock blue stripe (which also lowers the unnamed V3 grid cap to 500pf along with the 2m2 reistor and the voltage divider revoicing) and a lower value in the red stripe. What's the difference to tone and attack on yours since modding? If your attack is more pronounced I'll probably hold off, if it's around the same I'll probably go for simulclass specs. I also need to verify that 20pf will let more treble through compared to 10pf! I'm guessing that's what the 0.1 cap in the II is doing compare to the 0.047 in the III too. it made all the difference in the time domain." Assuming boogie have taken these values direct from the IIC+ non EQ they traced, and I will until anyone can say otherwise, I'll add this to my IIC+ schematic as a list of potential mods. I doubt this is the only the secret to the non EQ IIC+s being preferred by many players but anything is possible! Apparently the 60W reverb models are the nicest. Seems weird! Lowering the value of C30 brightens the amp right, but then why does increasing the value of C27 also brighten the amp? I would have thought increasing value = brighten, reduce value = darken but I'm not an expert. Maybe increasing C27 is to counter balance C30 being reduced? If that's the case though I don't know which way (higher or lower) has the effect on brightening or darkening!! Or I'm completely wrong all together - need's some experimentation done I think to find out. 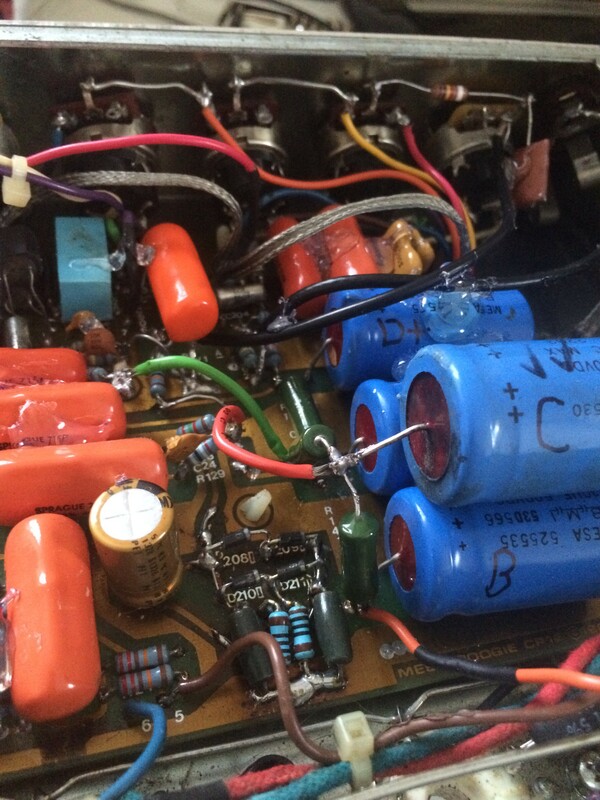 Also in other news, speaking to Boogie and xdg999 sending me some pics it seems the Black Dot (the earliest III) uses a different kind of R2 channel and different circuit board (CP1D) to the others. It only has 1LDR for R2 and doesn't have C214 anywhere. 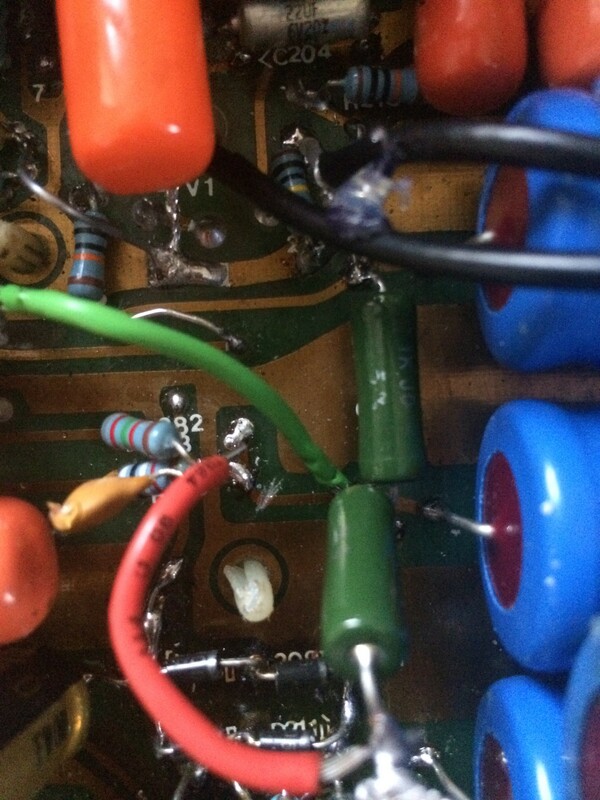 So anyone looking for a +/++ switchable III > IIC+ the best candidates are probably the purple stripes or black stripes with the CP1E circuit board which have two LDRs for R2 and engage both R130 and C214 in R2 mode as well as causing a slight ground shift on the tone stack. The earlier the transformer date on them the better (so black stripe preferred). 1985 dated transformers or earlier ideally. CP1F and higher (Red Stripe onwards) seem to add another LDR to engage treble shift on all the time when R2 enabled, but from reports from lions and others this causes a graininess factor when treble shift pulled in lead mode regardless of R2 being enabled. It should be able to be removed but requires some modding work (until I can trace one I won't be able to give instructions on modding those but lions is looking at doing this at the moment for his blue III>IIC+ conversion). You could also probably still mod a CP1D board in adding C214 (10uF cap preferred to .47uF!) and making that on/off switchable if you wanted but it's gonna be more tricky. Just some useful info hopefully if anyone is reading through this. I've been taking a look at Triaxis schematics recently, and it looks like their "Mark III" mode on the Triaxis has little in common with the III schematically, although I suspect it's doing something similar electrically, so those values might not necessarily represent a schematic lineage from the IIC+ non-EQ versions, but hey they probably do, just something to consider. I'm pretty sure my amp has that 60w transformer! That or something pretty analogous. That's why I'm trying to verify it. I've seen people say 20pf makes things darker and brighter, so I'm totally lost. I think I'll do the mods I have planned incrementally so we can use the information on which changes affect the sound, so no C30/C27 changes for now, just the III circuitry, LDR6 etc removal. I would be surprised if LDR6 was causing the graininess, unless it's that 360 resistor in the LDR6 circuit causing it, but we'll find out soon enough. So if anyone who actually understands amp circuitry has any info on the difference in effect between 10 and 20pf at C27, and whether just removing LDR6 and its associated components would work without causing any issues that would be super helpful. The last thing I want to do is remove it and find it permanently enables treble shift on R2 or something! The Mark lll+ is back home and it sounds fantastic. Everything about the amp is improved. It’s quieter and smoother. The reverb is better. The touch response is awesome and the R2 mod makes it the perfect amp for me. I had Mike B. reduce the brightness so now I can set the presence at 5 or 6 instead of 2. I’ll definitely be sending the Black Dot to Mesa for the lll+ mod. The Black Dot is on it’s way to Mesa for lll+ mod and service. I almost wanted to keep it stock. It’s a very fast and aggressive amp. Mike B. said it should still be more aggressive than the Black Stripe lll+ because of the 105 transformer. I'm considering doing (or having done) a IIC+ mod done to my black dot Mark III DRGX. But, while instructions have been posted here concerning the mod for a black stripe version, I guess I need to know how a black dot and a black stripe are different first. I'm also seeking more information about whether or not this tonal mod is the direction I really want to go in. Knowing full well that I'll never have the talent or skill to even get on the same continent with Steve Lukather, I would like to get the sort of tonality he got out of his late 80s Mesa based rig, knowing full well that a large part of his sound was due to his Bradshaw rack and of course a lot of his tone comes from his fingers. As I understand it, he was using a IIC+ as the basis of his tone, but yet that's also the same thing that is the foundation of the Metallica tone, too. And these two examples are dramatically different in their overall sound, so that's the part that's confusing me. Is it really the case, that a single type of amp can sound as different as Hetfield's tone AND Lukather's tone? They just seem so fundamentally different to me that I have to find out before I commit to modding anything, so I don't end up doing a mod with expectations that have nothing to do with the final reality. Oh...micro rant. I really do wish that Randall Smith had learned to draw schematics the "Standard" way, that being, inputs on the left, outputs on the right. Supplies on top, grounds on bottom. Most of his schematics are backwards, with inputs on the right and outputs on the left, and it's like trying to read a Japanese book. Read it in a mirror! It'd make comparing the IIC+ and III schematics a LOT easier. Supposedly Black Stripe = Black dot. I would imagine there may well be some small differences but you could open your amp up and take a look for yourself. Resistors are colour coded! The Metallica sound is in the IIC+, but it takes a lot of EQing to get to the album sound, you can get ballpark tones out of a IIC+ though easily. I should clarify, the instructions I gave turned out to be for a really weird Jan '86 Black Stripe. It was kind of a crossover between a Black Stripe and a Purple Stripe Mesa made for a few months with the new production board (CP1E). I think it retains a lot of the values from the Black Stripe but has the Purple Stripe CP1E board! Not the CP1D board of the Black Dot and Black Stripe. xdg999 sent me some pics of his black dot and black stripe but one was done post III+ mod so I cannot verify that they were the same to begin with. They both have the CP1D board but they could have different components. I would imagine it's pretty unlikely though most likely scenario is Black Dot = Black Stripe for all amps up to those with the CP1E board made from around 1986 shortly before the purple stripes. My serial is 163XX for reference. So my instructions on here don't really apply to a 'traditional' Black Stripe/Dot I'm afraid! I actually redrew the schematics for the IIC+ and III the correct way round as it was annoying me too! I added any extra info I've found as well. 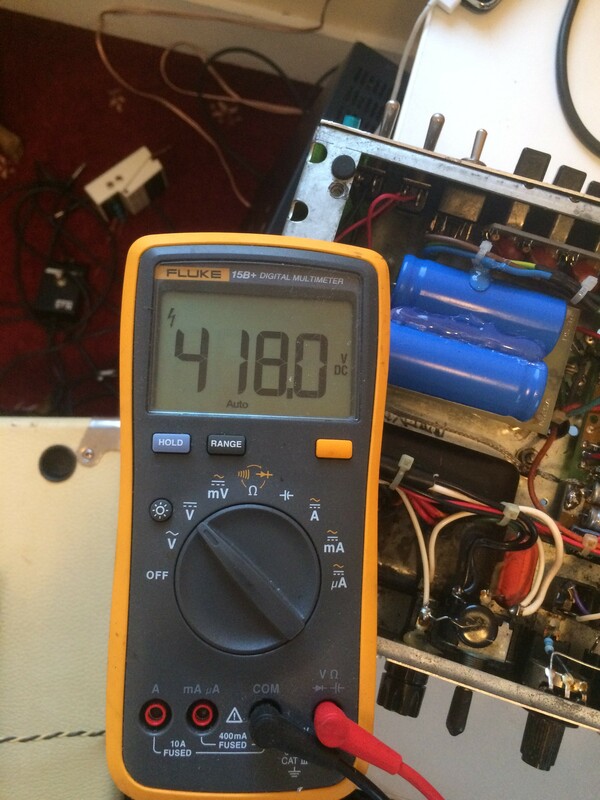 The III is 100% correct for my weird black/purple crossover amp, and the Mark IIC+ schematics are accurate Component values can differ slightly though as they used what was on the shelf at the time. The more info I get the more I'll stick on my schematic. Last edited by jrb32 on Tue Dec 18, 2018 6:57 am, edited 2 times in total. Your III should be able to do this already though as it's very similar to a IIC+. They're both VERY versatile amps. The main difference is feel and brashness. If you can't get close to the sound your after, then no amount of modding will get you there. It's not a night and day difference after doing the + mod, it's more a 'tone shaping' of what was there originally. Anyway with this new info in mind, there were two steps I missed due to not having a verified IIC+ schematic. Adding a 0.022uF cap in the lead circuit after the 680K R26 resistor (just add it between the lead drive pot and the wire coming off R26) and removing C23 as it's not in the power circuit for the IIC+ (easy) and adding in and rewiring the high voltage supplies for the 12AX7 preamp tubes (difficult!). 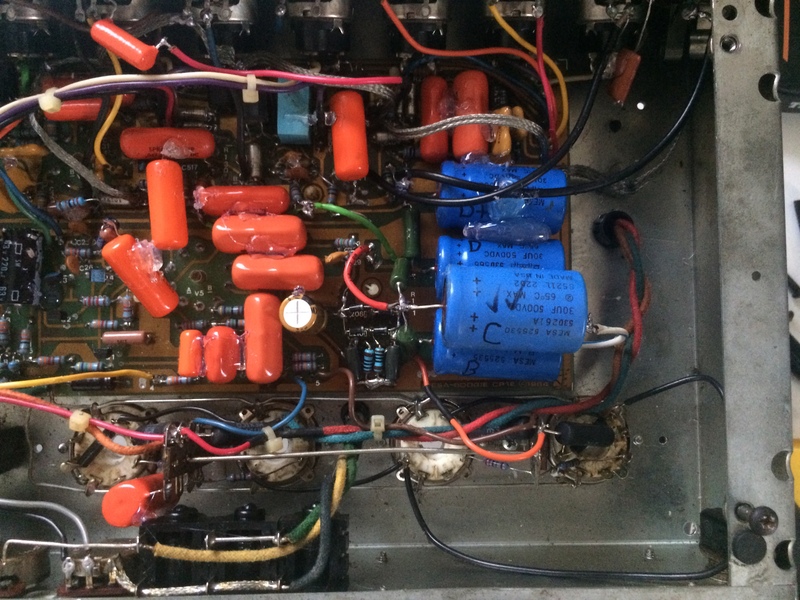 So what happens is in the IIC+ the Preamp, Lead and Reverb all work off a lower plate voltage (call it D+) with the voltage depending on which resistors are used between the 30uF filter caps - 1K, 5.6K, 6.6K etc as they vary between amps and which transformer is used as some have higher voltages than others. 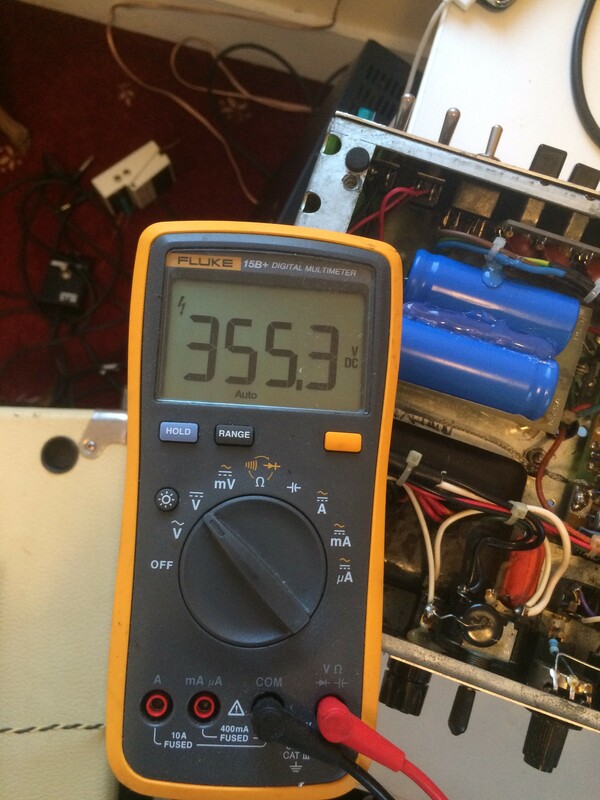 In the III they're basically all working off a much higher voltage (C) of around 420V. I'm not an expert in valve amp design, but higher voltage is going to mean a more aggressive tone? To quote another forum "Lower voltages tend towards a softer squishier tone/feel while more=a brighter crisper tone but at the cost of a more harsh high end". This would explain a lot of the character of the III as having a rep of being too aggressive. 1. Add in a 30uF filter cap between the old C and old D (I had a spare good but old one lying around but I will replace it with a new one from boogie soon). This added cap becomes new C, old C becomes new D. Add in a 5.6K resistor between original B (stays the same) and new C (higher value resistor for more voltage drop between rails, lower for less). Wire negative pin of 30uF cap to ground using insulated wire. 2. Move the original 5.6K resistor to between new C and new D.
4. Wire the D+ filter cap (used to be D) to the V1, V2, V3 and V4 plate voltage resistors with some bridge wire. 5. Desolder the old V2 plate voltage resistors from D+ and run some insulated wire to connect them to new D.
6. Desolder the leg of R282, R129/C24 that used to go to old C and run some insulated wire to wire them up to the new C.
It's easier to see from the pics. The filter cap added just clears the top of the chassis but I might look at moving it elsewhere. This is from a purple stripe board (CP1E) with black stripe values but I think the voltage rails are basically the same on all IIIs. Anyway to those who say a III to IIC+ can't be done it definitely can! It's VERY involved though to mod to this extreme and unless you know what you're doing I would avoid it. It's not just 'oh change a couple of caps and resistors and there you go'. Hope that helps someone out there! I may do a thread with full steps and diagrams at some point, and hopefully a Mark III thread where I get all the info up along with schematics for each stripe version and the differences between them. Last edited by jrb32 on Tue Dec 18, 2018 6:58 am, edited 1 time in total. Great work! I hear you on the "add C30 and you'll get a IIC+" thing. It's good to know that it is possible to do this, especially with how costly IIcs of all varieties are. I suppose you'll always run into the power transformers used on post-105 IIIs but I bet it's a smaller difference by far than the sum of all the other differences between a IIc+ and a III. I haven't gotten around to doing it yet but my black dot Mark III is the export version (MASSIVE transformer!) and I'll be sure to crack it open over the next few days and post my supply voltage values just as a point of reference. I bought another c+ off a forum member on Saturday. I took the lll+ with the 105 transformer so he could check it out. He agreed with me that it’s really close to a c+. I’ve got a Mark lll SRG Black Stripe on the way. If I like it I’m going to send it to Mesa for the lll+ mod. Capacitors pass high frequencies better than they do lower frequencies. The value of the capacitor changes the frequency range that is passed without significant resistance. If the capacitor is placed in series in the audio circuit, it'll reduce bass frequencies passing through, for a brighter sound. 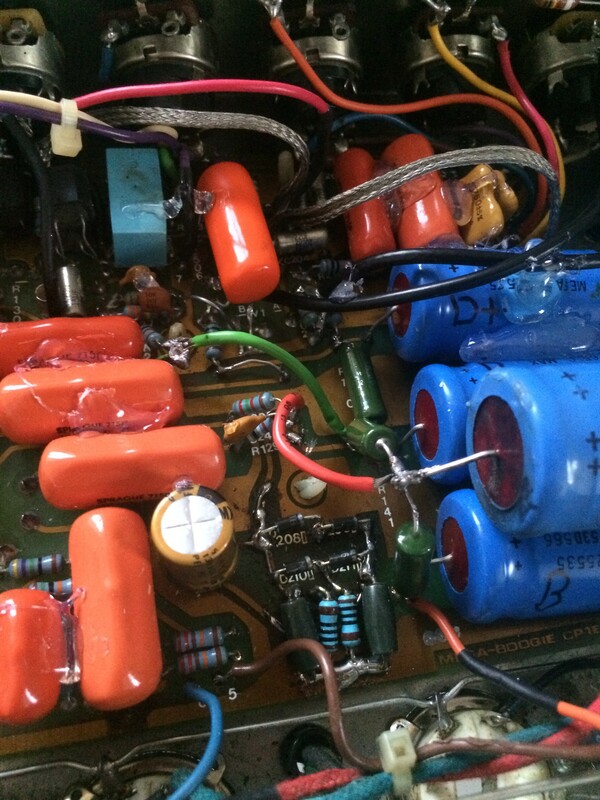 If the capacitor is placed across the circuit and going to ground, it'll bleed off high frequencies to ground. This will make the tone bassier. So, a single capacitor can either cut bass or cut treble, according to whether or not it's placed in series in the audio path or placed across the path to ground. I'm still contemplating modding my black dot Mark III. Since I truly don't give a hang at all about R2, I don't even care that there are some differences in the R2 LDR switching. In fact I'd be perfectly happy to lose R2 entirely. It's not a channel I have any use for. I play either clean or balls out almost all the time. Any time I may want to back off a little I just roll back the guitar volume and there's what I need. Modding yourself or sending to Mike B? If modding yourself I can send you over some stuff I've got regarding the black dot including schematics and board layout if you like? They're taken from pictures I was sent by xdg999 so might have some minor mistakes so worth double checking on yours, but you can compare a IIC+ schematic and the III black dot schematics and mod from there. I'd keep the R2 LDR switching (it has no detrimental effect in the black dot, it does from red onwards) and add in a ++ boost. It's pretty easy on the black dot - you would swap out R130 with a 10uF (I used a 15uF T110 as I had one spare - close enough to 10 right?) and swap one leg from R230 to R204 so it's on the cathode of V2A. Get rid of R133/C28 and hardwire R105/C47 to ground with some bus wire. It's easier when you go through the schematics to see what I'm talking about. Alternatively you can just get rid of R2 completely if you want. Also for reference I'm pretty confident black stripe = black dot. They were all the same with the same circuit board. There was a weird period before the purple stripe (my one! just my luck) where they used a purple stripe circuit board with black dot/stripe values before changing the voicing and adding a purple stripe to the back. I'm going to do a Mark III thread at some point once I can get some more info on later stripe values and board revisions. I've also redrawn my IIC+ and III schematics to fit them onto two pages to mirror the official boogie ones. I'll upload those soon once I can proof check them and will eventually have different versions for the different IIC+s and the different III stripe versions! I regret taking on this task slightly now!! Anyway give me a shout if you want some schematics for comparison.